Many of us buy boxed candy for someone we love on Valentine’s Day usually wasting some of it because it’s not exactly the kind of chocolate we love! I, on the other hand, am one of those people who much prefers those hand made gifts. 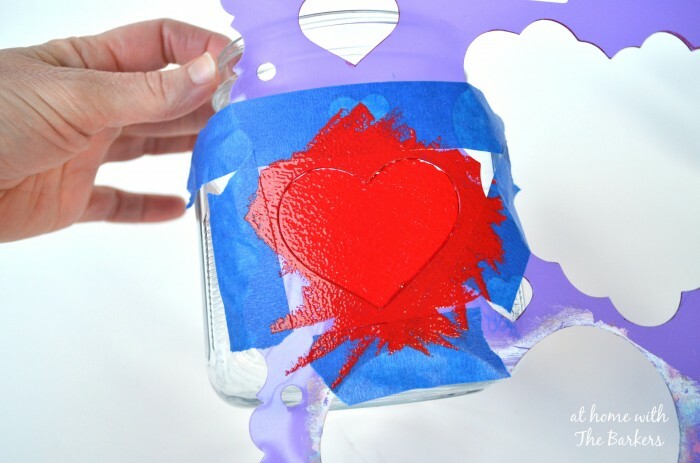 This blog post will show you how to make your own Valentine candy jar and fill it with the perfect candy! Valentine’s Day…the day of love and chocolate! In reality when you love someone you should show them everyday not just on a day assigned on the calendar! BUT it sure is fun to do something a little extra special and sometimes even corny for the one you love. To me February 14th is all about that little extra day of fun. 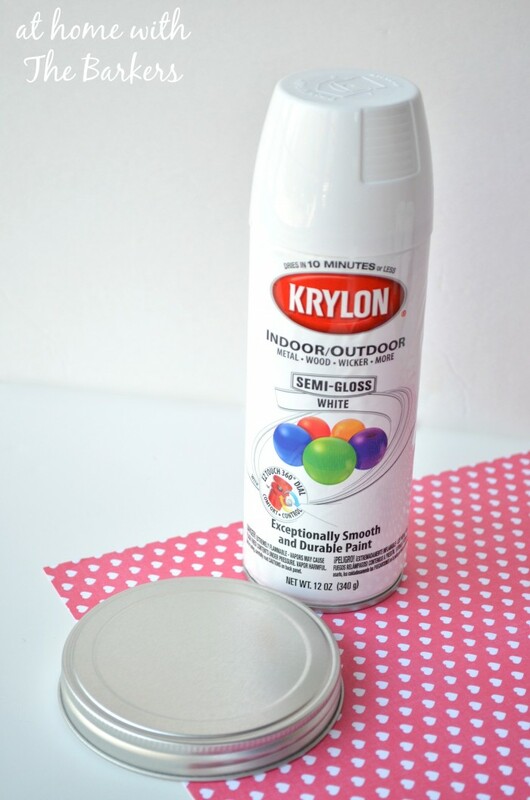 I took the metal lid and spray painted it white first. After the paint dried I used a piece of scrapbook paper from my stash to add to the top. 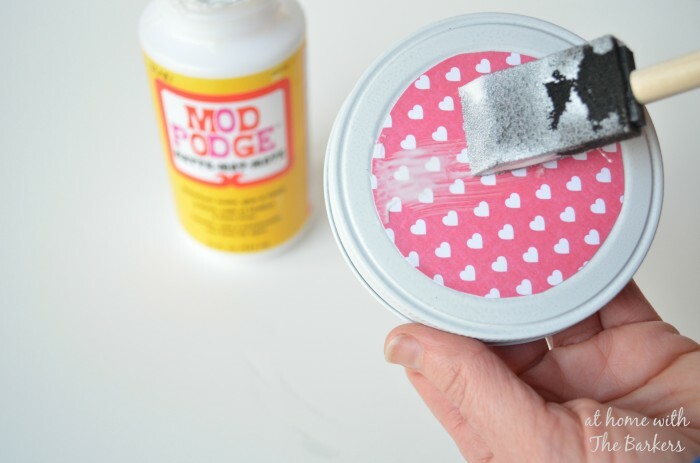 Using Mod Podge is an easy way to add paper to the lid. I added the glue to the bottom of the paper to stick it down, then I put a layer across the top to seal the paper. 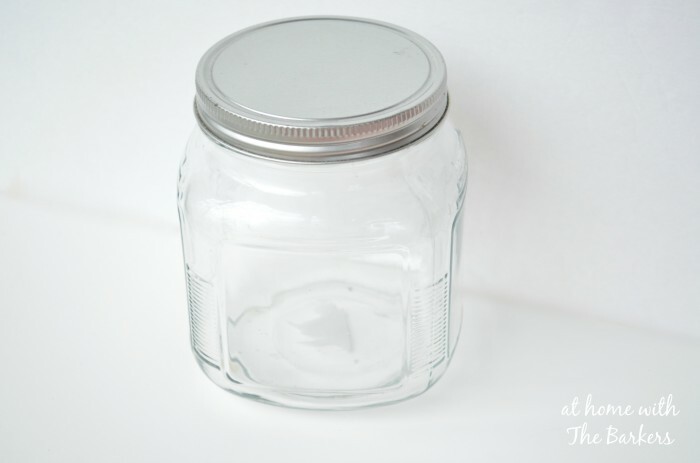 The Mod Podge looks clear when it dries. 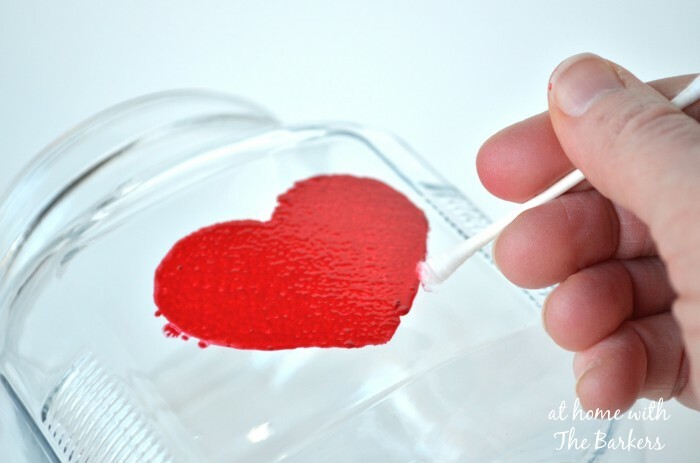 I taped a heart stencil to one side of the candy jar then filled it in with some red paint. I always press too hard when I use a stencil so I have to get the extra paint off when I’m done. I just use a Q-tip with a little water and wipe it off while the paint is still wet. 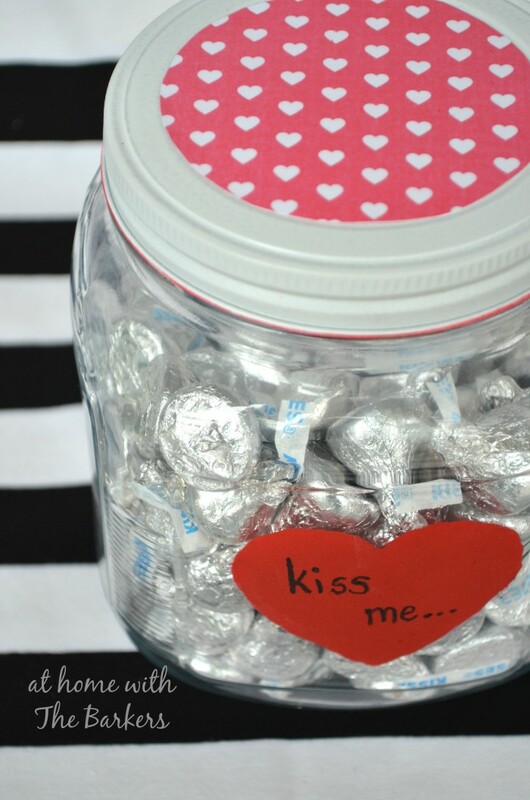 I filled it with Hershey’s Kisses and wrote Kiss Me with a Sharpie. I think it turned out so cute! I admit it’s also a little corny too…BUT that makes it even better to me! 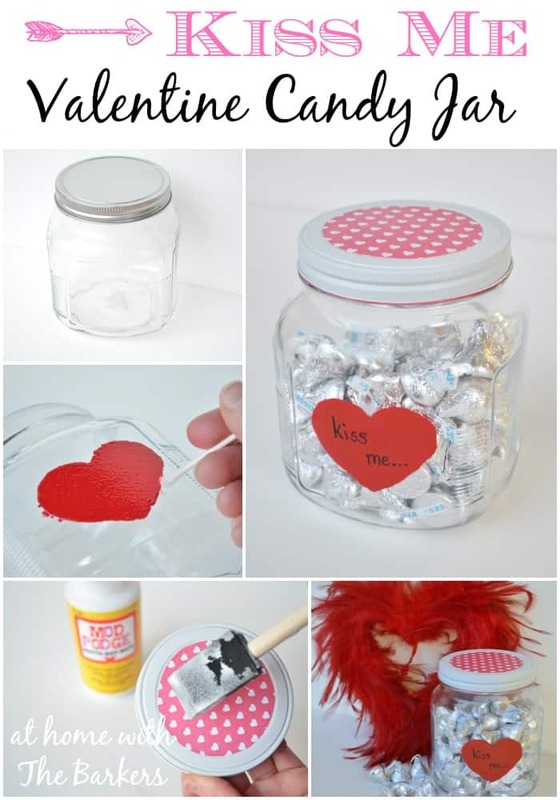 Do you give store bought or personalized Valentine’s gifts? Also, do you prefer flowers, chocolate or BOTH? Pin this Photo below to save for later! How cute is this! 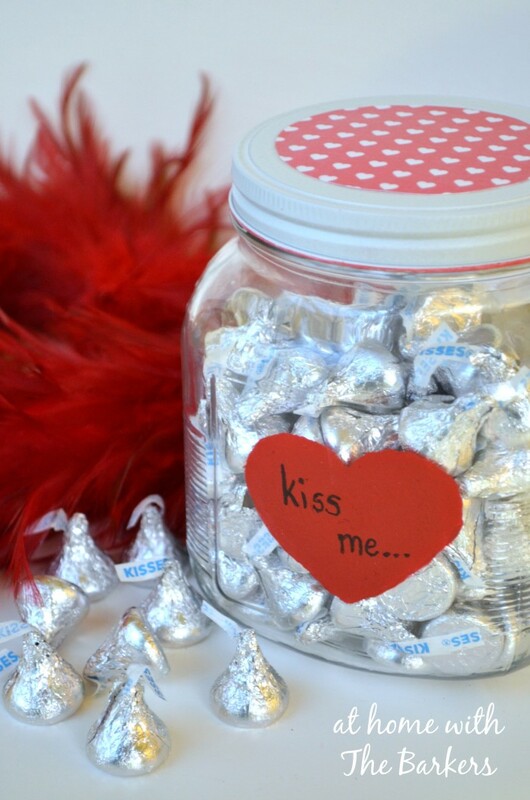 I love that you filled it with Hershey Kisses. Too bad I would eat them all before they ever made it to be displayed! So cute! I love giving hand-made gifts to people. I think it definitely does make them feel even more special than a generic box of chocolates. Yes, I think it does too! Love the sweet personalized touch you gave the candy jar Sonya!